What was the role of the second front? Two scholars debate the opening of the Western front and its role in ending the war. The English and the Americans broke the neck of the Luftwaffe and the Soviet Union broke the back of the German ground forces. Coordination in the planning and execution of military operations has always been the most difficult part of working with a coalition during wartime. Dealing simultaneous blows to different fronts has obvious advantages, but such synchronicity of action meets with great difficulties in practice. In the case of the Soviet Union and its Western Allies, there was no real coordination or harmonization. The reasons for this, however, lay not in the political sphere, but in the reality on the ground. During the preparations for the summer campaign of 1944, difficulties accumulating ammunition forced the Red Army to delay the start of Operation Bagration in Belarus, so it did not synchronize with the landing of Allied forces in Normandy on D-Day. Similarly, poor weather conditions that made it difficult to use aircraft made it necessary for the Soviet command to shift the dates for the start of the Soviet Vistula-Oder Offensive until after the Battle of the Bulge had already ended. For a long time, the opening of the second front in Europe served as grounds for fierce political debate. There were many accusations made that the U.S. and the UK delayed opening the second front so that the Soviet Union would exhaust itself in the fight against Germany. There is another, stronger argument, however, that there were great technical difficulties in invading Europe from the sea. The main problem here was capturing a seaport that would make it possible to provide an uninterrupted supply of a large mass of troops. 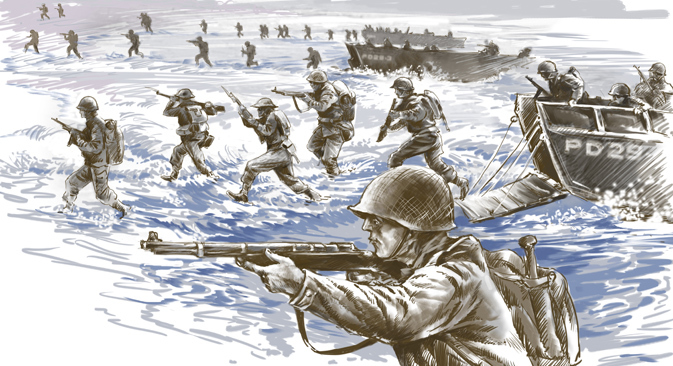 The raid on the seaside town of Dieppe in northern France in 1942 had shown that the Germans were aware of the threat and prepared to defend the French ports. Additionally, simply capturing a port would be no guarantee of success for a long-term operation. The Germans could blow up the port infrastructure as they withdrew, which is exactly what happened with Cherbourg. Because of these experiences, the invasion took place only after the idea of landing on a beach was proposed in the fall of 1943. The invasion of Normandy would require the construction of an artificial breakwater and floating piers, and a strong air defense, so the operation took months of preparation. It is important to note that the chief driving force behind the D-Day operation was American President Franklin D. Roosevelt, who insisted on the landing in France in 1944. Three-fourths of German casualties occurred on the Eastern Front. Even after the landing in Normandy and the opening of the second front in Europe, the total losses of the Germans on the Eastern Front were triple the losses on the Western Front. After concentrating almost all of the strength of its air power in the east in 1941, however, the Luftwaffe’s forces were gradually pulled to the Western Front in defense of the Reich. The daily American bombings of Germany became a way of drawing out the German fighters. The contribution of Soviet soldiers and officers cannot be overestimated. The victory was achieved at the cost of millions of their lives. But the second front helped to speed up the victory over Germany, which in turn helped save the lives of many Soviet soldiers. Alexey Isaev is a historian who specializes in World War II and is the author of a number of books about the war. In the Foreign Office, the British bureaucrats worried about the Red Army winning the war without their help. On July 3, 1941, 11 days after the Wehrmacht invaded the Soviet Union, Ivan M. Maisky, the Soviet Ambassador in London, met British Foreign Secretary Anthony Eden to discuss the military situation and the larger question of Anglo-Soviet military cooperation. Attacking the Soviet Union, Maisky said, was Hitler’s first big mistake. “Russia is eternal” and cannot be beaten,” Maisky said, but it needed help. The Soviet Union was bearing the full force of the Nazi juggernaut. Could the British government not make some landing on the coast of France? Such a move would indicate the willingness of the British. This was the first Soviet request of many for a second front in the west to take German pressure off the Red Army. In the summer of 1941, Britain was in no position to undertake a landing on the coast of France. The British army had yet to win a battle against the Wehrmacht, although they had been at war for two years. Britain said it was doing its best to help the Red Army, but not even British public opinion believed that. The British ambassador in Moscow, Sir Stafford Cripps, accused his own government of shirking the fight, letting the Red Army take all the casualties. Soviet opinion, he said, believed that Britain was ready “to fight to the last drop of Russian blood.”The U.S. State Department also had a poor opinion of the Russians, but President Franklin D. Roosevelt did not share the views of his bureaucrats. He worked to overcome anti-Soviet resistance and, in November 1941, announced the extension of the Lend-Lease program to the Soviet Union. Then, in December 1941, everything changed. The Red Army won a strategic victory in the Battle of Moscow, breaking the aura of Wehrmacht invincibility. In the Foreign Office, the British bureaucrats worried about the Red Army winning the war without their help, so finally the discussion returned to the second front in France. In February 1943, the Red Army victory at Stalingrad sealed the fate of Nazi Germany. And still the only place where the British and Americans were fighting German ground forces — and there only with three divisions — was in North Africa. Roosevelt finally put his foot down. At the Tehran conference in November 1943, he allied himself with Stalin to insist that a second front be established in France. Churchill resisted, but to no avail. Planning for the Normandy Invasion became the priority. By the time the Western Allies landed in France in June 1944, the fate of fascism in Europe had long been determined. But better late than never. Stalin was pleased to have some relief for his forces. If the U.K. and the U.S. had not finally joined the fight in France, Red Army soldiers would have washed in the waters of the English Channel, which is just what worried the Western Allies. Europe would have been liberated by the Red Army alone. Michael Jabara Carley is a professor of history at the Université de Montréal and has published widely on 20th-century international politics.